Almost 8 years since it began, First Fridays continues to build an audience for the Exchange District's creative community! 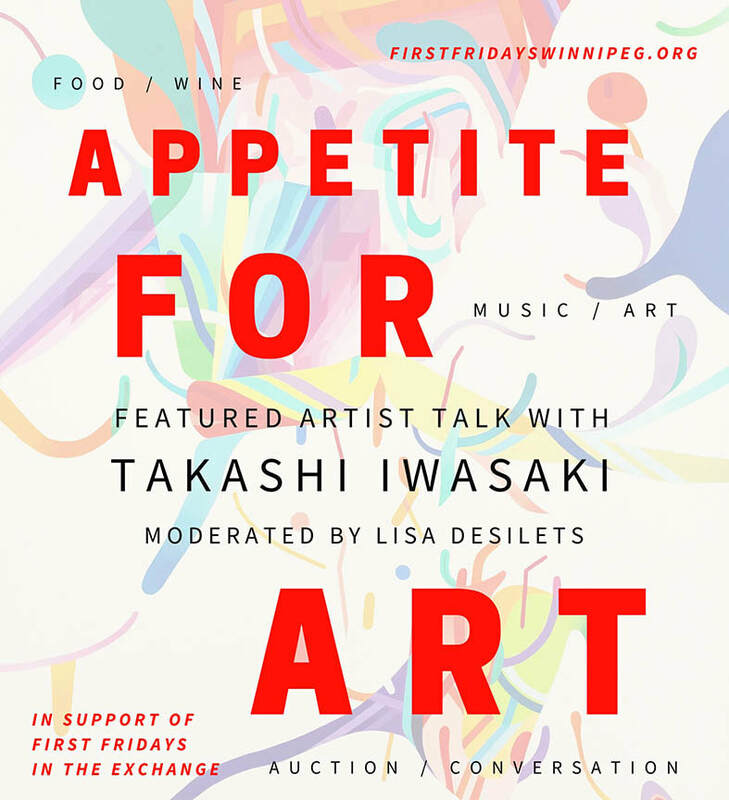 Join us for our fundraiser: an evening reception of food, wine and music, an art auction, and a featured talk with artist Takashi Iwasaki, moderated by art consultant Lisa Desilets. Limited Tickets $40 ea. In support of First Fridays in the Exchange and Winnipeg artists. 1982: born in Hokkaido, Japan. Moved to Winnipeg to study fine arts at the University of Manitoba in 2002, where he earned Bachelor of Fine Arts degree. Attracted to the Winnipeg’s vibrant multi-cultural community and supportive art community, he gained the permanent resident status in Canada and now lives and works in Winnipeg and calls it his hometown. Ms. Desilets (Bachelor of Fine Art, University of Manitoba; Bachelor of Education, Université de Saint-Boniface) is an Accredited Member of the International Society of Appraisers. With over 30 years of experience in art administration and art education, she has worked as the Visual Art Consultant for the Province of Manitoba, responsible for the Province of Manitoba Art Collection. In the past, she has managed, or acted as board member, for numerous not-for-profit art galleries and organizations, and has sat as member of the Acquisitions Committee while serving as a Trustee of the National Gallery of Canada in Ottawa. the Exchange District’s art to the stage.